It’s difficult to spend time in the board gaming hobby and not hear the name “Reiner Knizia.” His name is a staple in the industry, and depending on your gaming sensibilities, that can be a good thing or a bad thing. For my birthday, my sister gave me one of Knizia’s flagship games, Ra. And while for me Knizia’s fame is a very good thing, not everyone agrees with me (namely, @Futurewolfie). Read on for an explanation of the game and our review. Spoiler alert: lots of disagreement ahead. 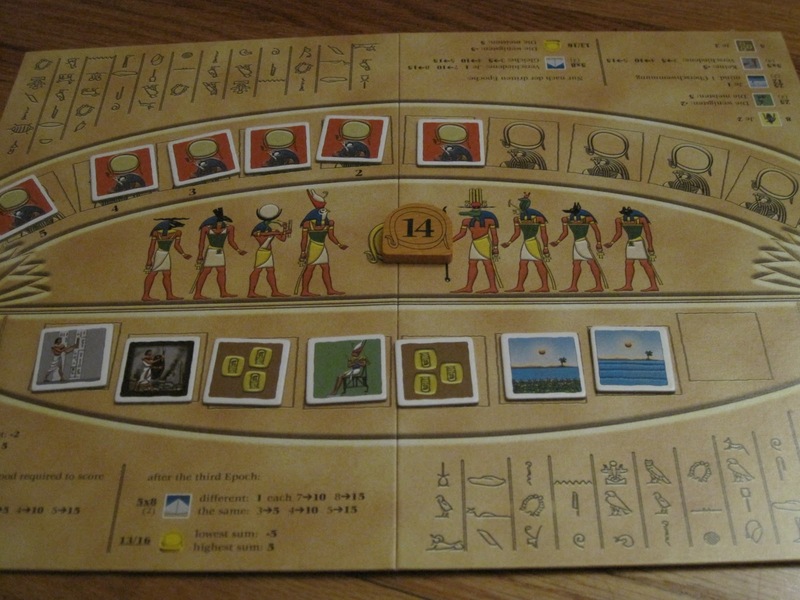 Ra is an auction game with Egyptian flavor. The game is played over three epochs, and the player with the most “fame” at the end of the third epoch wins the game. Fame is earned through acquiring sets of tiles in the auctions. 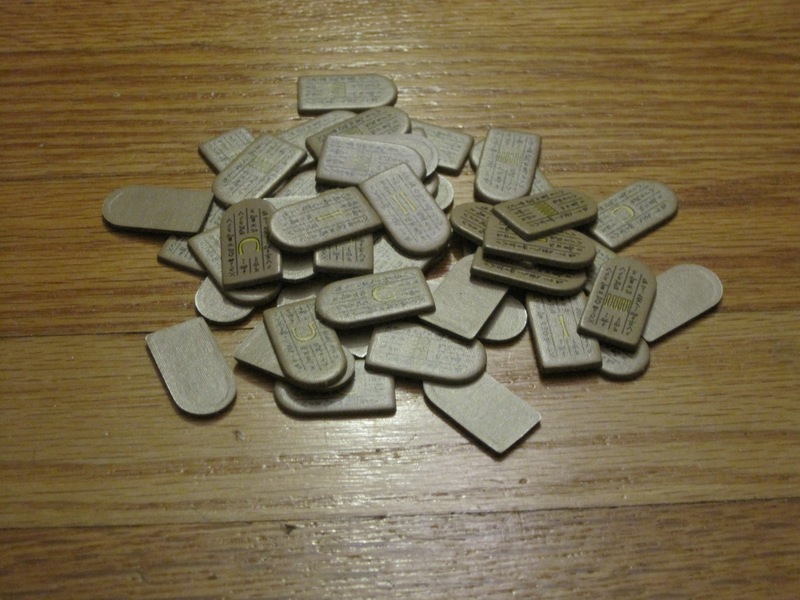 At the start of the game, players receive “suns,” wooden bidding chips that each bear a number 1-16, dependent on the number of players. The sun distribution is fixed (not random) so as to create balanced bidding power, and which suns each player has is open knowledge. The sun with the number 1 is placed in the center of the board as the starting sun. The sun tiles around the Ra figurine. Players voluntarily call auctions by slamming this figurine on the table and yelling “Raaaaaaa!” at the top of their voices. Or something like that. Players may do one (and only one) of three things on their turn: they may draw a tile from the bag and add it to the auction track; discard a god tile they won in a previous auction to take any tile on the auction track into their play area; or call for an auction. The most common turn is taking a tile from the bag and adding it to the auction track. All tiles are placed directly onto the auction track when drawn. The exception is Ra tiles, which are the most common tiles in the bag. When a Ra tile is drawn, it forces an auction. Instead of being placed on the auction track, Ra tiles are placed on the Ra track at the top of the board, and this determines the length of an epoch. When the Ra track fills up, there is no final auction (even if players still have suns or there are tiles on the auction track): the round is over immediately. Ra is played with a variety of tiles and, true to Knizia form, each kind of tile offers a different opportunity to score points. Gold and god tiles are worth points straight-up. 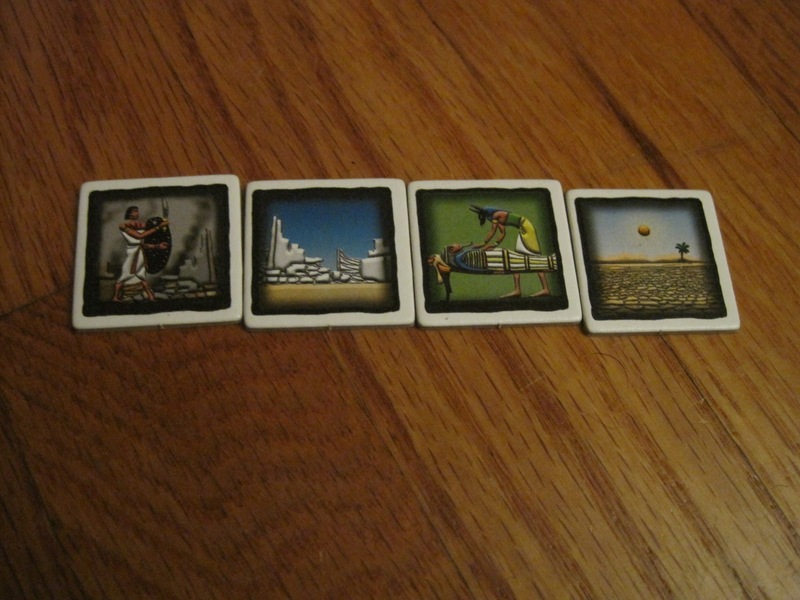 Nile tiles score points only if a player has collected at least one flood tile in an epoch. 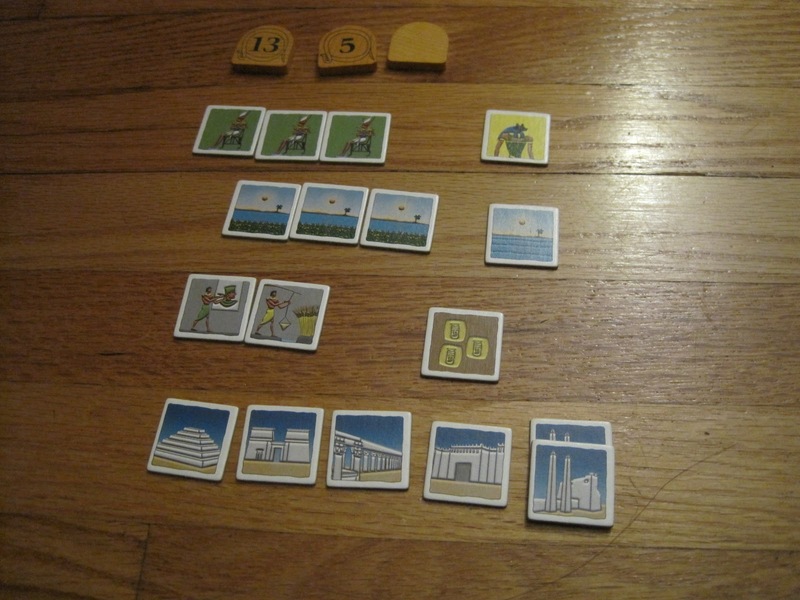 Pharaoh tiles score points relative to what the other players have collected. Civilization tiles aren’t worth points unless you collect a variety, but not having any forces a player to lose points. And then there are the monument tiles, which only score points at the end of the game and reward you for obtaining them broadly (variety) and deeply (the same set). There are also disaster tiles that force the auction-winning player to discard certain tiles, which can significantly affect the value of the auction track. Instead of adding a tile to the auction track, a player may use his turn to voluntarily call an auction for all the tiles currently on the auction track. Auctions are simple and work the same whether forced or voluntary. Each player gets one chance to bid, in player order, ending with the player who called the auction (or drew the Ra tile). If a player passes, there is no second chance to bid. 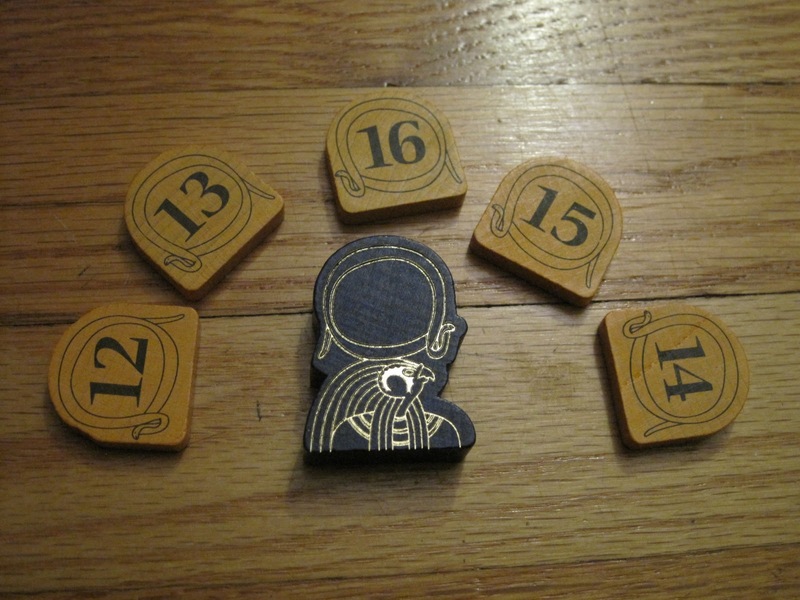 The player who bids the highest-numbered sun wins, collects all the tiles from the auction track, and exchanges the sun he bid with the sun in the center of the board (for use in the next round). If the auction is forced, no one is required to bid; if the auction is voluntary, someone must bid. What the board might look like during play. An epoch ends when either the Ra track fills up or no players are able to bid. After scoring at the end of the epoch, only some tiles carry over into the next epoch: Pharaohs, Niles (but not floods), and monuments. At the end of the third epoch, whoever has the most fame points is the winner. I think Ra is a fantastic game, both clever and enjoyable. I’ll get this out of the way early: I chose the term “flavor” rather than “theme” while explaining the game because while the tiles used in Ra bear Egypty pictures, this game could take place anywhere and be the exact same game. Despite the art, the game doesn’t feel like it’s Egyptian. 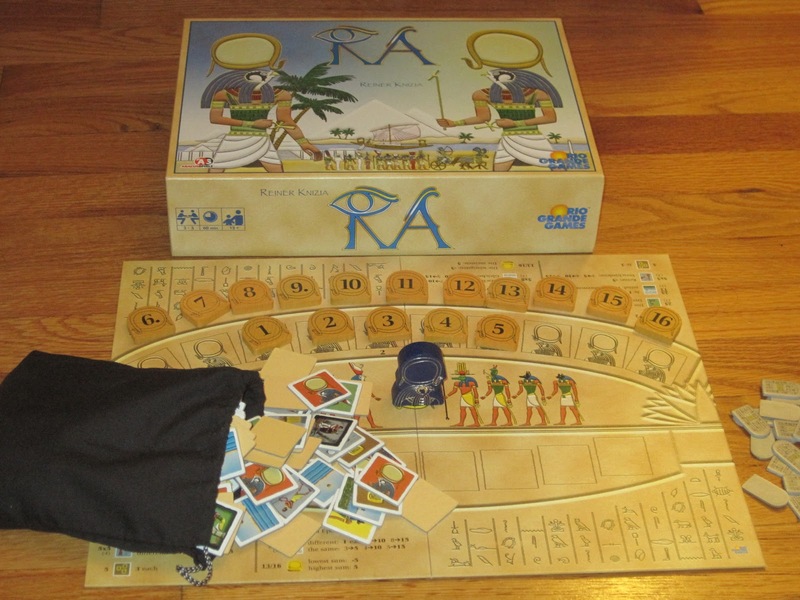 Knizia is often charged with making games with pasted on themes, and Ra is no exception. For me, this isn’t an issue at all, and I like the artwork depicting Egypt. What I love about Ra is that there is always an interesting decision to make. The scoring system forces these decisions because tiles score differently (and often only under certain conditions): what seems like a worthless auction to someone might be a game-winning haul to someone else. A disaster tile might really be disastrous for the player who has the targeted tile type; it might not affect another player at all. This keeps players on their toes as they carefully watch the auction track and what other players have. Should I wait until there’s something on the track that I really want, or should I bid defensively to keep someone else from getting what they need? There is also the consideration of the sun in the center of the board. Just because I receive the highest sun at the start of the game doesn’t mean I’ll keep it. Players must be careful which auctions they win. If the sun in the center of the board is low, trading a high sun for it will strongly affect bidding power in the next round. On the other hand, even a small (or empty) auction track is enticing with a high sun in the center. I find this mechanic brilliant because it balances decisions and makes players consider more ramifications than just final scoring. Examples of how the tiles might look in your play area. Another thing I love about Ra is the balance in the game. A lot of this is due to the sun exchange mechanic I mentioned and the distribution of suns at the beginning of the game, but even during the game, no player is ever truly out of the action (unless they bid all their suns early, which I try to counsel against). A player who has low suns can still win good auctions: the key is to trigger auctions before they’re ripe for players with more bidding power. And for players with lots of bidding power, the goal is to make the track fill up as much as possible. Since which suns players have is open knowledge, players have a better idea of what it will take to win an auction. This can lead to analysis paralysis, but most of the time play moves briskly. Ra is not without its haters (@Futurewolfie among them). It can be tough for beginners to know how much and when to bid. It can also be difficult to foresee the problems of winning just any auction that looks good; you always have to consider the position it will put you in for the next round. Also, being out of the action early by using all of your suns can put another player in a position to run away with the epoch. I did this once and raked in a large haul over my opponents because they exited bidding too quickly. Epoch lengths are also variable and largely based on chance (if Ra tiles are drawn early, it will be shorter; if later, it will be longer), which may annoy some players (especially those who were hoping for a longer epoch). Now, are these problems with the game itself? I don’t think so. It is, however, something to warn new players about, and Ra is not without a learning curve. Ra has quickly ascended to become one of my favorite games. It’s interesting, very interactive, and all this in a package that is easy to teach, takes right around an hour to play, and has good components to boot. I’ve played it with two, three, four, and five players, and the three-player game, for me, is the sweet spot (you have more control over what happens), though the other games are still fun. If you like auctions, interesting decisions, and brilliant scoring mechanisms, give Ra a try. I don’t think you’ll regret it. Let’s just be honest here: I don’t like this game very much. It may have something to do with my first games going very, very harshly against me, but I would be doing a disservice to you, our readers, if I didn’t point out what made playing this game a frustrating experience for me. Ra can be a pretty brutal game; if you make mistakes early on, it can be incredibly hard to recover from them, and in the meantime, you will constantly get beaten over the head with how much your poorly earned bidding tiles are worthless. Ol’ @FarmerLenny lauds the game’s balance, but I remain unconvinced. I’ll use the 4-player pre-set sun distribution for my example. The distribution looks like this: 2-6-13, 3-7-12, 4-8-11, and 5-8-10. Essentially there are 3 tiers of numbers—low (2, 3, 4, 5), medium (6, 7, 8, 9) and high (10, 11, 12, 13). The person with the largest high number has the smallest low and medium numbers, and vice versa. From my experience, the person with the lowest high number (and as a result, the highest low and medium numbers) has the most powerful buying power in the current round; the player with the biggest high number is in the best position to set themselves up for future rounds. The two middle players are just kind of stuck in between. In fact, every game I played, the player that started with the highest number won the game, and did so by a landslide (50+ points versus 5-15 points). Fame tablets are how you keep score in Ra. Here’s why I think this is: having the highest number allows you to win any auction you want; this puts the player with the highest number in a position of comfort. The other players always have to force auctions early because they know if it goes too long, it’ll be a veritable gold mine handed to that player. In the meantime, having the lower numbers in the lower tiers allows you to bid low-risk for two reasons: one, to force the other players to use their higher tiles if they really want what’s out there. And two, if they decide not to go up to that higher level, you can score some decent tokens with a very low bid, and likely trade up your number for the next round. Then, if you have the higher numbers of the lower tiers, you can win auctions that others have boosted with their own lower-tier numbers without having to sacrifice the next-tier-higher of your auction pieces, putting you in a comfortable position. Those left in the middle, though, have neither the low-risk low numbers nor the powerful high numbers, and I think that puts them at a huge disadvantage. I also think that there is more luck involved here than @Farmerlenny would like to admit. The game can swing wildly based on the tokens that are drawn. In my first game, in the first epoch I ended up being the only player left with auction tokens. I was prepared to score, but suddenly the tiles that were drawn filled up the Ra track before I had a chance to do anything. I was advised to not wait too long to spend my auction tokens. In my second game, however, I tried to use my auction tokens at a reasonable time; some to try and gain the tiles, some to try and push my opponents into bidding higher—but @Farmerlenny didn’t take the bait and ended up the last person left with auction tiles. Only this time, the Ra tiles weren’t appearing, and he ended up scoring almost a full track of tiles and getting the highest number back for the second round. Same situation, but luck swung the tide one way or the other. There was no way of predicting that the epoch was going to last that long. Another game, I had scored two god tiles and was waiting for a key moment to use them to switch out a tile from the auction track that would boost my score significantly; unfortunately, not only did that key moment never arrive on my turn, but I never even had so much as a chance to use those god tiles on a less-than-useful tile. It wasn’t my poor choices that got me into that situation; I just got screwed over completely by the luck of the draw. Ra is a game in which I always feel like I’m making the wrong decision; I also always feel like my choices are between taking something kinda sucky for myself or allowing another player to score a sweet set of tokens. Since I can only call an auction on my turn, a lot of tiles can get added if I pass up a single opportunity to force an auction, enough to turn an auction I could win but is kind of useless into a ridiculously sweet auction that someone else can win and take from me. There are dozens of ways to get screwed in this game; you may have too many low numbers, meaning you can’t win the auctions you need. You may have too many high tiles, meaning everyone else will call auctions forcing you to spend big on a small gain, or else stay out of it and risk the epoch ending early. You might finally see the token you need, only to have the next player pull out the disaster tile that hurts you the most. You might think you’ve got a good run of points going, only to realize you missed out on a certain piece and thus lost points for that particular set, cutting down your score heavily. You may never have even had a chance to gain that piece. I’m not a huge fan of games whose backbone is a very arbitrary scoring scheme. I’m definitely not a fan of negative points—talk about adding insult to injury! I don’t really like how everyone has a completely different set of auction tiles and how some are more powerful than others. Okay, to be fair, I don’t hate Ra completely. I would play it again. And, as I said to @FarmerLenny, if the most recent game I played had been the first game I played, I probably wouldn’t be so antagonistic toward it. I do like many of the elements: the choice between calling an auction or adding another token; a variety of sets that will score points in different ways, making certain auctions more valuable to some players than others—which, in turn, leads to the tough choice of bidding to prevent another player’s big score versus bidding to gain your own. This game is definitely interactive—you can’t just do your own thing and have any chance of winning, you have to pay attention to the other players. I do like the public knowledge of what every other player has—in tokens and in auction tiles. And I do like that bidding an auction tile sends it to the center giving others the chance to get the bigger tokens. Still, Ra is not a perfect game, and it’s not for everyone. It can be very harsh and unforgiving, especially if you make mistakes early on. It’s very tough to figure out what your best choices are and very easy to make the wrong ones, and luck can drastically swing things one way or another. Rarely do @FarmerLenny and I have such dissenting opinions on a game. However, @FarmerLenny has played this more often than I; so more plays could soften me up to it a bit. I also tend to prefer more thematic, story-like games while @FarmerLenny likes his auctions and things with wonky scoring mechanics. You might love this game, you might hate it; at least you have both sides to consider here. Want another opinion? Check out @BGJosh’s Ra review. Next Article FDQ: What Theme Grabs Your Attention? Great review guys, when you guys disagree I think your review format truely shines. Personally I side with FarmerLenny on this review. I absolutely love Ra, and would comfortably put it in a list of my top 10 games. I think that the game design is brilliant and an excellent example of simple rules and choices with a depth of strategy and variability. I love clever auction mechanics and find that if they’re implemented well with tough decisions then it’s up to the players to keep the game balanced and stop a run away leader. I’d say this is very true with Ra. Since I agree with FarmerLenny I’ll mostly comment on some of Wolfie’s impressions. I’m not saying that everyone needs to love this game but I hate to see it bashed for elements that I think are present to add depth, variability, and fun to the game. Obviously your mileage may vary on the fun part based on whether you enjoy the mechanics. I’ll start with some points that I do agree on so it doesn’t seem like I’m just here to argue. Yes, the game can be swingy. But it is pretty quick to play and as FarmerLenny pointed out, playing with three players gives you more control over the game. Ra can also be extremely brutal, I’ve seen a decent player end the game with less than his starting 10 points! I’ve also seen games that seemed like they were over after one player’s lucky run in the first epoch but another player made some solid/lucky plays of his own over the next two epochs and came out on top. I generally think that experienced players mitigate a lot of the luck present in the game. You can definitely get screwed by a combination of good players and bad luck but again the game is relatively short and you won’t have to suffer for very long. Regarding the luck factor, I think the game has a very obvious push your luck element that makes the players utilize constant risk assessment. You have varying amounts of control throughout the game but the key here is every time you have to make a decision (either on your turn or during an auction) you have to decide how safe or risky you want to play. There are lots of factors to consider and all of them add up to how risky your decision ends up being. Since you don’t know what tiles are coming up next or how long the round is going to last it’s not obvious what move to make. This keeps the game simple (not a lot of choices, lots of hidden information) and the tension high (how much do you want to push your luck). I think this is the key element of the game and what really drives the action. On the starting tile distribution. I personally don’t think that anyone has a clear advantage going into the game but I believe it does encourage players to adopt a certain play style in the first round. I think this is good because you can’t go into the game with a strategy in mind. The 2-6-13 hand has a clear advantage and disadvantage. It can easily win any auction but then is stuck with two very weak tiles. I actually dislike this starting hand the most because you’re hoping that you get a good set to bid on but if it’s a short round then it may never happen and if it’s a long round then this advantage is mitigated by multiple good sets coming out. I’ve seen many times where the player with the 13 either doesn’t use it in the first round or caves and buys a decent (but not great) set because the other players are blocking him from winning anything with his other two tiles. Also, I don’t think that the two low tiles are truely “low risk” because if you call an auction to force a bid on a set then you’ll likely get beaten if it’s decent or are forced to take it if it’s bad. Also, this only works as long as the other players let you get away with it since once you end up winning the auction you no longer have the tile to force early auctions with. I’m not saying there aren’t smart ways to play with these tiles but I think that it’s trickier than you’re making it out to be. The 5-9-10 hand has another set of advantages and disadvantages. It swings towards the other extreme as the player with the 13. It isn’t guaranteed an auction as long as the other players are holding their high tile (usually most of the round) but can win some solid sets that others don’t want to use their high tiles on. I’ve seen this player win 2 auctions with his 9 and 10 that another player was able to grab with just his one high tile. The other two hands land somewhere in between these two extremes. They have less extreme advantages and disadvantages. They aren’t burdened by low tiles like the player with the 13 and have more assurance to win the really great auction than the player with the 10. I personally think that the variable turn length is the true equalizer that makes these advantages and disadvantages get blurred into a non-issue. Lastly, I’m not entirely clear what you mean by an “arbitrary scoring scheme”. I think the scoring mechanics in the game are very clever and represent varying degrees of risk and strategy. Gold is always a safe option, God tiles are pretty safe (2 vs 3) but can have a big pay off, People are solid and then have a push your luck element to score big if you continue to invest, land are very swingy and either return a solid score or nothing at all, monuments are a long term build up that nets you nothing in two of the three rounds. These are all unique options for scoring and have pretty clear degrees of risk since the tile count is known. … starting 10 points? What? One time we were playing this and my mother asked us why we kept saying “I am okra”. That is now our standard phrase for starting the auction.